This year at the state fair, I decided to create a filipino dish: palabok. It is similar to spaghetti in which it consists of noodles, sauce, and toppings. Usually palabok is traditionally made with shrimp and egg. I decided to put a vegetarian twist. First you sautee the garlic until lightly brown, add the onions, add the carrots when the onions become transparent, and add salt. Meanwhile, a separate pot should be brought to boil to add the noodles in. The noodles are done when a strand can be pinched to break, but not too easily, if it is easy to pinch then the noodle is too soft if it is difficult to pinch it is too hard. Another pot should have 4 or 5 cups of water brought to a boil. Once the water starts boiling, add the anatto, cayenne peppers, sauteed vegetables, vegetarian broth and the cornstarch solution. After the noodles are drained and washed, place the noodles in a serving tray. Put a little sauce and distribute it to all the noodles, then pour the rest of the sauce on top. Add any toppings you like! I like to add fried tofu, fried shiitake mushrooms, and a chopped egg. For times sake at the fair, I skipped frying the tofu and the shiitake mushrooms. 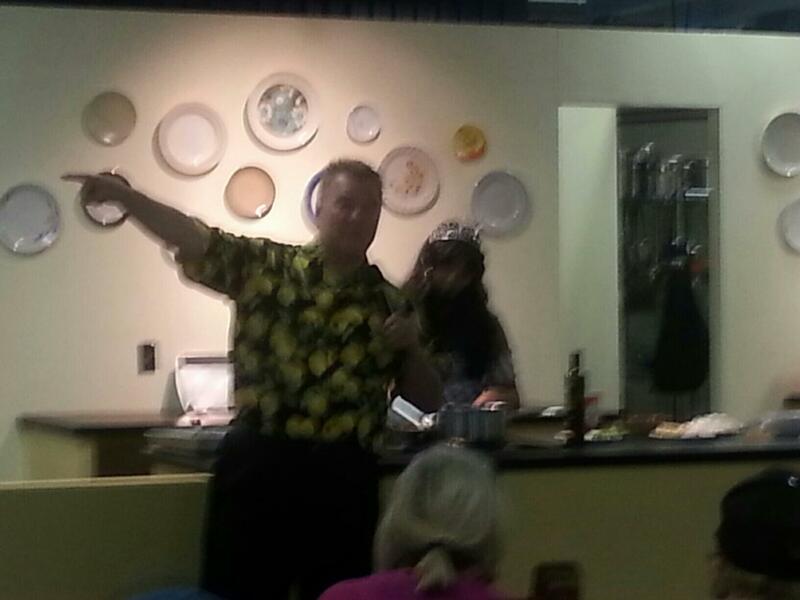 I had a wonderful time cooking at the state fair! 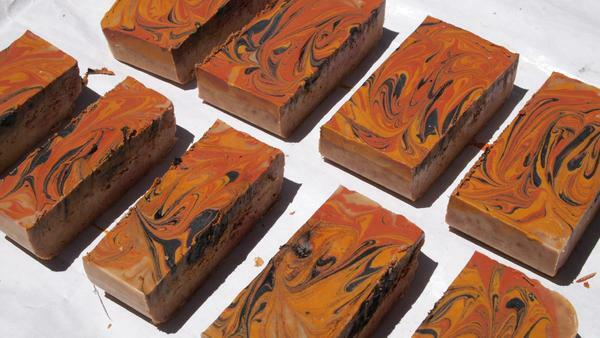 I have stated before that I absolutely LOVE making soap from scratch! This picture features the newest loaf of soap I have created! The idea came from a friend who loves ginger and everything ginger. I usually only use olive oil and coconut oil, but this time I decided to use avocado oil and grape seed oil into the recipe. The soap feels so luxurious. It smells a lot like banana bread. I was a little nervous about adding these additives, because additives accelerate the solidification during the soap process which sometimes leads to solid soap in a bowl. I would make soap everyday if I had the resources. Sodium Hydroxide isn’t very hard to come by, the most difficult ingredients to obtain are the oils. Olive oil, coconut oil, avocado oil and grape seed oil is expensive. I enjoy making my own soap, it isn’t difficult at all! All you have to do is watch out for burning your skin off working with sodium hydroxide. It makes me feel like a real scientist. I traveled to San Francisco to visit my dad. 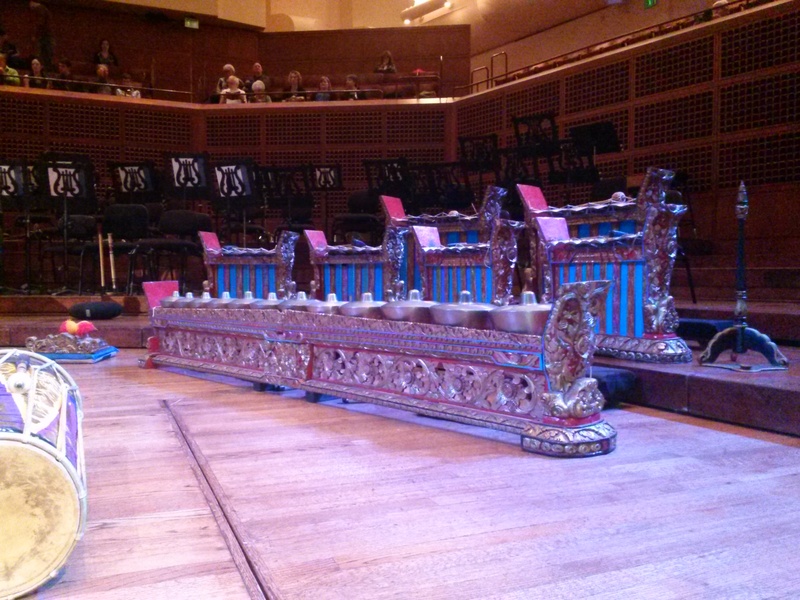 The theater featured a piece Sekar Jaya Gamelan. 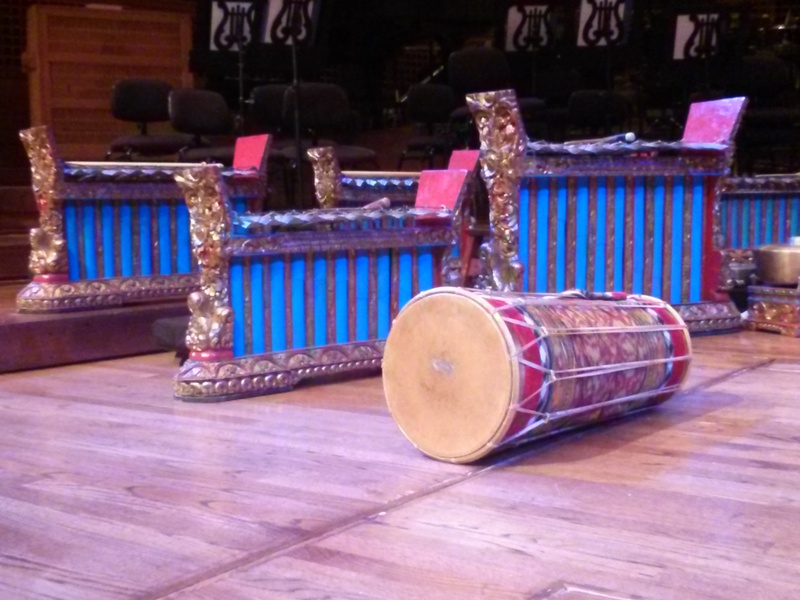 My mother was always fascinated with the gamelan and I desperately wanted to see a live show. 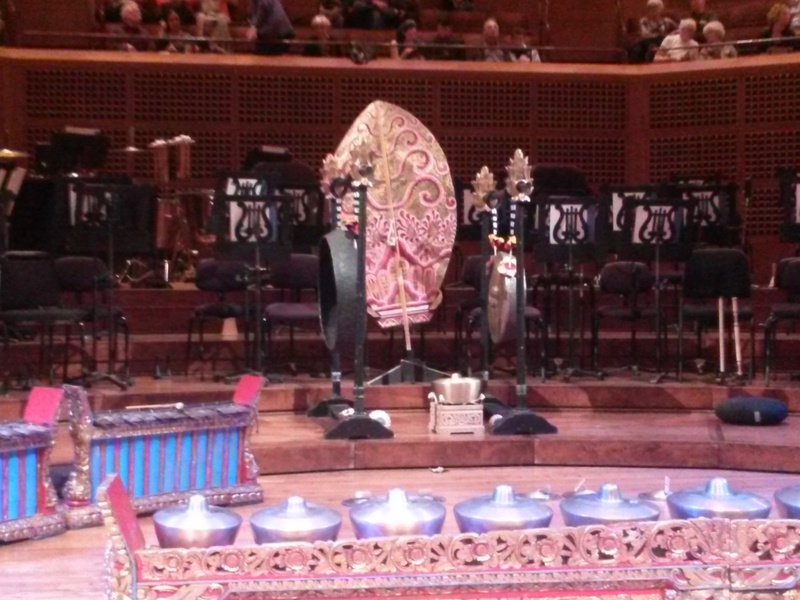 I would have taken pictures during the performance, but I thought it would have been rude. After the Sekar Jaya Gamelan concert, we traveled to a community center in San Francisco where they premiered “Anita’s Last Cha Cha”. It was an amazing movie! The acting in the movie was impeccable! I usually do not enjoy Tagalog movies because they always seem overly dramatic. This movie was an amazing mix of comedy and self realization. I strongly suggest everyone who reads this post to watch this movie. I believe it truly explores the complications associated with Filipino women, especially the newer generation growing up to the modern times yet surrounded by traditional values. When the movie comes out on Blu-ray DVD, I will immediately purchase it! On January 20th, Monday morning, I attended the Martin Luther King Jr. Parade and celebration at the Sacramento Convention Center downtown. Martin Luth King Jr. appreciated all diversity of cultures! I was so happy to see so many people collected to remember his message and entertain each other. Sacramento is full of so much love! 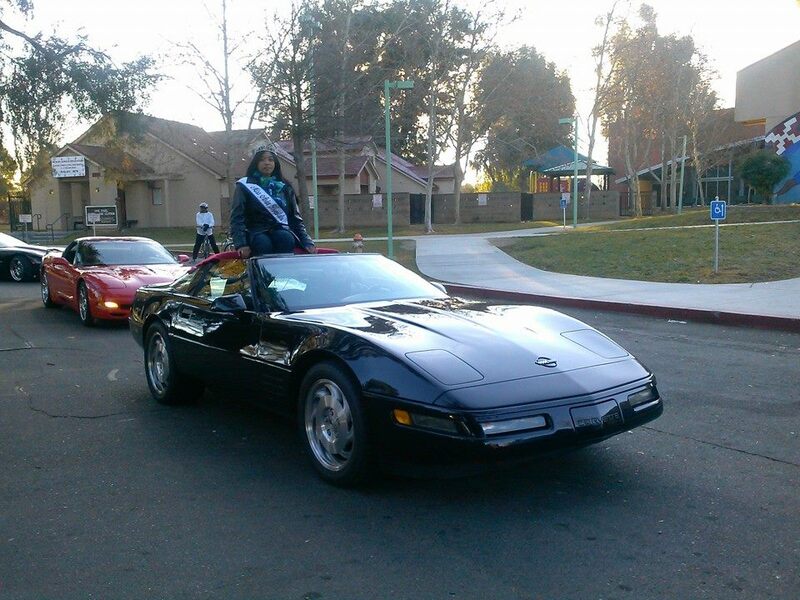 I got to ride on top of a corvette for 2 hours waving at everyone. I’ve never ridden on top of a car before, so this was new! We drove past my favorite shops and the Fox and Goose eatery. 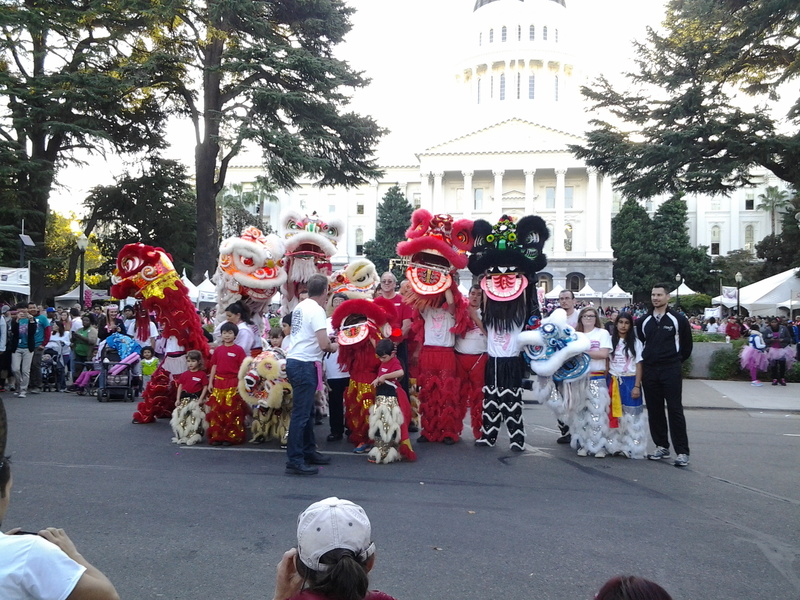 At the celebration, I had the opportunity to see many local performers and groups. I also had a glimpse of other people’s home-made soaps! I did not meet many people who created cold-process soap like I do, but it was still fun to see everyone’s creativity! Cold Process Soap is Fun! 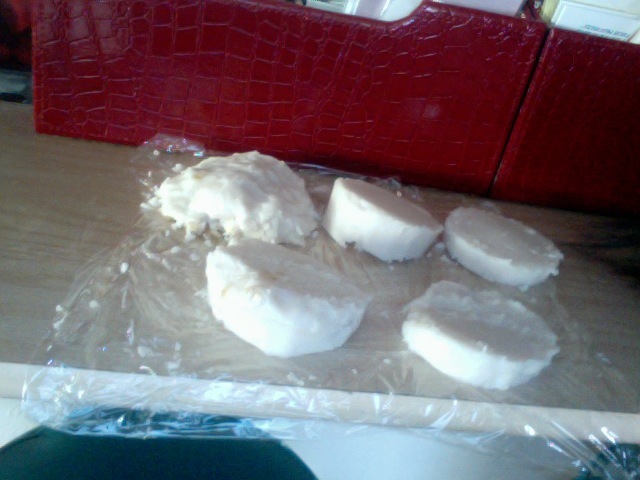 Above is picture of the first batch of soap I tried to make! I used shortening, water, and sodium hydroxide to make the soap. I used an old fast food cup as a mold. I used an index card to cut apart the soap. This was so much fun! I felt like a chemist artist. I didn’t expect the sodium hydroxide to make the water so hot!! Good thing I was wearing gloves and using a glass jar to mix them in. The first thing I did was mix 3 parts water with 1 part Sodium Hydroxide. I did this part outside because I read that it smells kinda bad at this part. This solution heats up to surprisingly high levels, so you shouldn’t touch it with your bare hands. Also, Sodium Hydroxide is a very basic solution which can irritate your skin. Then I went to the kitchen and melted down some oil, for my first try I used Crisco shortening. I poured the melted oil into another glass jar and went outside. By this time, the sodium hydroxide water solution cooled down a bit. I poured the sodium hydroxide solution into the oil and started frantically stirring with a wooden skewer. When the mixture turned into a very light pink color, I poured it in a fast food cup. 2 days later I removed the soap from the cup and cut it up with an index card. It was difficult to get the soap out of the fast food cup, I think I’d rather use a silicone mold next time. I didn’t add any colorants or oils so it doesn’t smell like anything and it doesn’t look like anything except a circle of soap. This was so much fun! I wanna do this again! This year’s Thanksgiving was very special to me. My cousin from Hawaii came to our home to spend it with us! 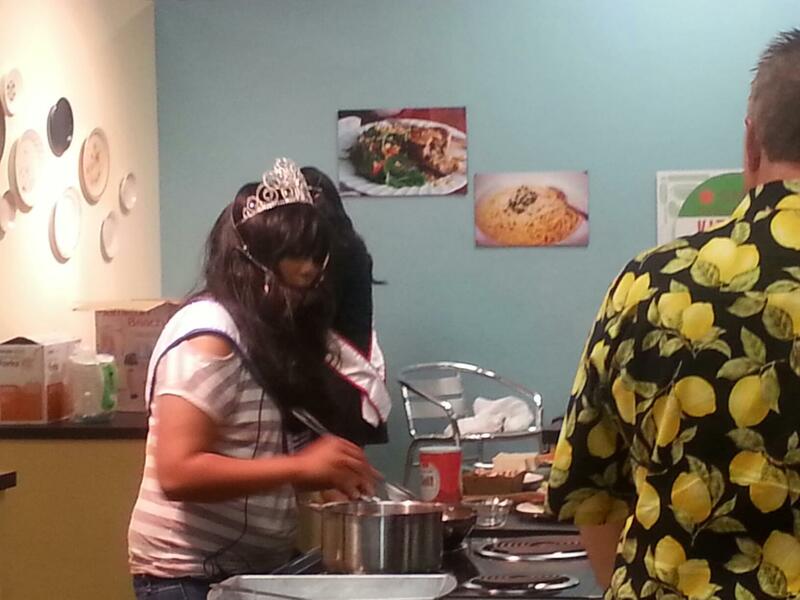 We ate an enormous dinner with turkey, Hawaiian Poke, rice, pancit, lumpia, lemon cake, tiramisu, steak, and many more! The next day, we took her to North Star, Lake Tahoe to see the snow. Unfortunately, there wasn’t any snow at that time. Ironically, there was a lot of slushy snow at the resort 3 days later. We spent a few hours ice skating in the resort. It was difficult to rent a pair of skates because there was so many people renting skates, and they didn’t have our size. In the meantime, we roasted marshmallows and made smores. My cousin would rather eat the marshmallows. We also walked around to see the shops that were around the resort. Our favorite was this candle-making store where you can also stuff fabric animals and paint pottery. My other favorite was a toy store that was close-by. The next day after that we went to San Francisco. We ate a nutella crepe, and saw the macy’s store tree. We also saw a huge gingerbread house at some hotel, there were a lot of recognizable celebrities recreated as candy on this house such as Walt Disney, Bruce Lee, and Socrates. Then we dropped my cousin off at her dorm and headed home. I’m glad I had so much fun with my cousin this Thanksgiving. The fall semester is finally over and I had a lot of fun in my classes. I have a few Cantonese phrases under my belt, and I learned a lot about making soap in my chemistry class. I was very happy to know that I needed a 20% on my final to keep my A in the class, but I studied anyway and did my best just to be sure. For my next semester I signed up for an art chemistry class, which means we are going to talk about intermolecular forces and structures. I am very looking forward to this class. I also have a second level calculus class next semester. My original line up didn’t allow for some classes that I need, but I chose to keep this class because if I didn’t choose to keep this second level calculus class I’d have to wait an entire year to take it. I chose not to wait a year to attend this class. I look forward to the next semester. On November 3rd, the American Medical Student Association volunteered to clean up William Land Park. Our job was to help clean up the ponds in the area. During our cleaning, they were having a walk there at the same time. So many ducks were expected to be fed, and they were so cute. We were given nets and a rake. Our job was to take out the trash, branches, dead leaves, and any dead creatures we find in the lake. We put what we fished out in a big garbage bag and then throw them into a nearby trashcan. If the branches were too big we stepped on them to make them smaller. We started at 9am and finished with our job by 12. They served us very good food! Everyone got a sandwich (with meat and vegetables if we wanted), and the option of putting peppers into our sandwich. They gave us chips, and waters for everyone. It was a lot of fun to work with a bunch of people who were interested in cleaning the public park! The Girl Scouts Renaissance Faire was held on Saturday at the Cosumnes River College. We performed a lion dance, this time with a Buddha. The Buddha’s job is to guide the lions and make sure the dancers underneath don’t damage the lion. The Buddha has a fan. When the Buddha started fanning me, I stole his fan and ran off with it. It was a very fun routine. After the lion dance, I helped Eastern Ways with the activities they had set up. One activity involved teaching the girls self defense. We would hold pads and teach them the basics of how to defend themselves. Another activity was a lion dance trial. We took a small lion and let the girls try to lion dance. We even guided them on some basic moves underneath the lion. The last activity involved filling a teacup with water and carrying the teacup to a bowl. The object of the game is to fill the bowl. It was a lot of fun! I was very tired afterwards, but I slept very well that night. 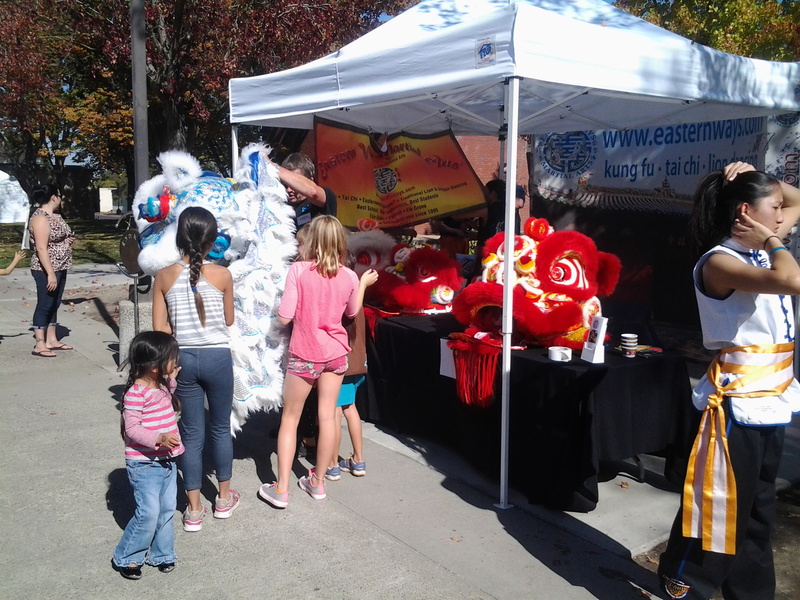 Last week Sunday, I attended the breast cancer walk with Eastern Ways Martial Arts. We came and supported the cure for breast cancer. I had the opportunity to speak with survivors. One woman told me she was glad to be able to still be alive because she got the opportunity to see her son get married and her grandchild’s birth. Last year, I believe the ratio was one out of four women will experience breast cancer. This year the ratio increased to one out of three women! I was shocked! I live with my mother and my grandmother, so it would be as if one of us got breast cancer. The breast cancer walk’s route is throughout downtown. We even walked through the downtown plaza. 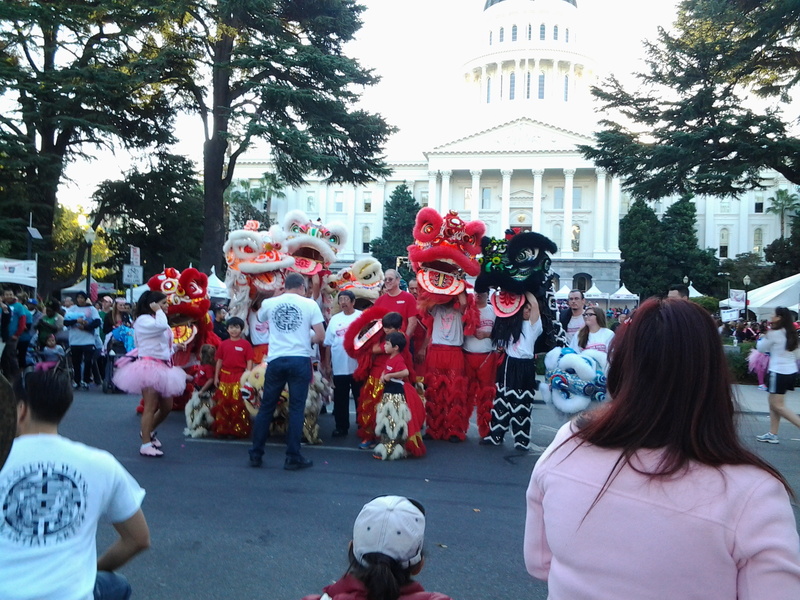 I participate in Eastern Ways Martial Arts lion dancing at the Breast Cancer Walk every year. It was a refreshing way to spend my Sunday morning. 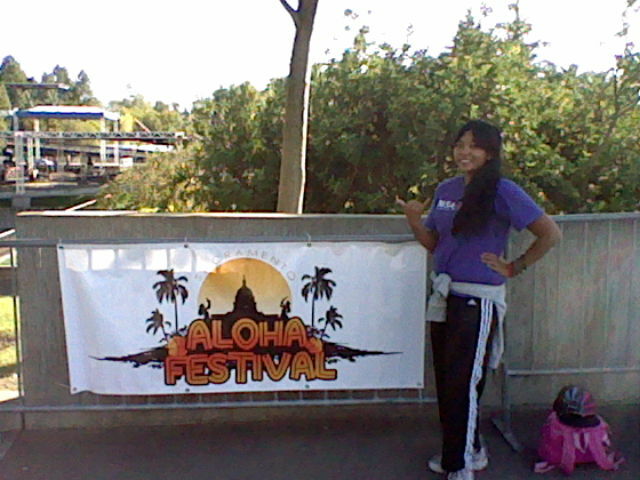 On October 5th, I attended the Aloha Festival at the Cal Expo. I am wearing a purple shirt because earlier that day I participated in a “Walk to End Alzheimer’s” event. I was from Honolulu, so the first place I wanted to check out was the food. Every time I visit my relatives in Honolulu they always want me to eat! But they say, food is love, food is medicine, and love is medicine! Every time I go to Hawaii, or when my uncle feels like it, I absolutely have to have fresh poke at least once! Imagine my reaction when I found out they were selling Ahi Poke at the festival! $9.00 was a lot but it was enough for me! 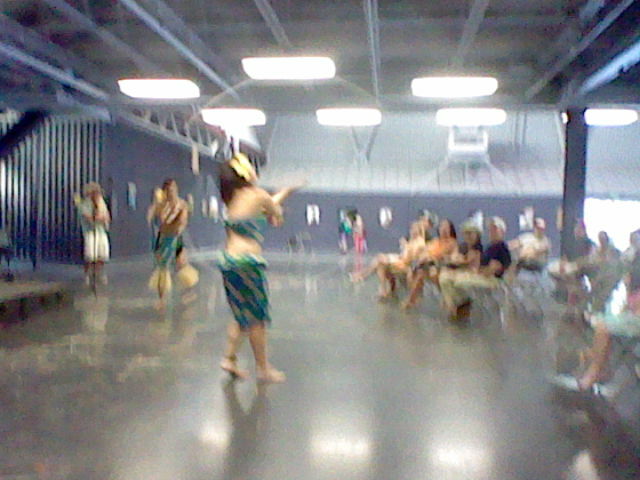 Indoors, I noticed some hula dancers and decided to watch. They were called the Pacific Island Dancers. At first it was the usual hula, but my interest peaked when they started integrating poi balls. The coordinator told us that they were going to do something a little different, they took two people and they did a poi ball trick battle! Both people did their own poi ball tricks and the person with the most applause won the battle. It was a lot of fun and I got to reminisce about the islands. 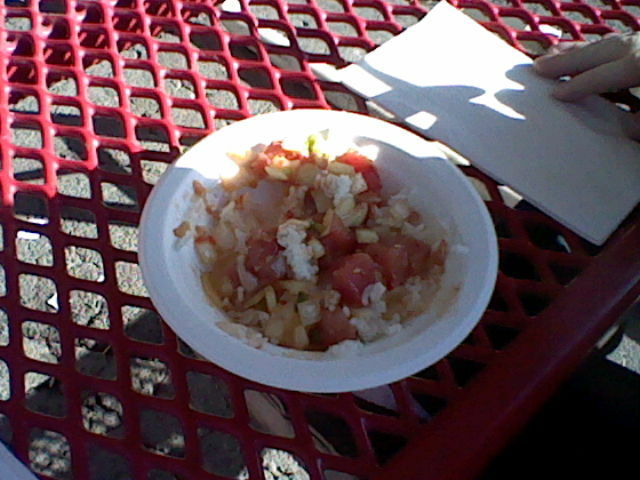 I still taste the poke mmmmm~~~!